Keep your insurance policies in a safe dry place during the storm. Never store them in a basement that might be damaged by flood waters. 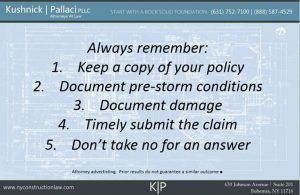 Of course you do not need the actual policy to be able to submit a property damage claim but it helps to have the information handy for the claims process. Keep all important documents in a safe dry place during the storm. This should include the deed to your home, title to vehicles, birth certificates and receipts for valuable items. All of these may be required when you submit your property damage claim. Make sure you have a camera with a charged battery ready to go. Photos are your friend when it comes to submitting a property damage claim. Immediately after the storm, take a written inventory listing all of the damage that you notice. For all damage you list, take a corresponding photograph. You will submit these as part of your property damage claim. Call your insurance company to report the damage. Arrange for an appointment for the insurance adjuster to come out and view the damage as soon as possible. Write down the claim number that the insurance company gives you on the phone. This will help you track your property damage claim with the insurer. Follow up your phone call to the insurance company with a letter submitting and outlining the claim. If possible, leave non-emergency repairs so that the adjuster can see them first hand. If the adjuster will not be there quickly, then make sure you notify the insurance company that you will be commencing repairs before he or she arrives. Document all repairs and remedial work. The last thing you want to do is compromise your property damage by destroying the evidence you need. Photographs and videos are your friend in an insurance claim. If you hire anyone to do anything keep a written record of the scope of work and the amount you paid. Once the insurance company sends out their adjuster they will likely send you their position in writing. Generally, there are three options for the response: 1) they accept the claim and will pay it; 2) they reject the claim and will not pay it; or 3) they accept part of the claim. If the insurance company accepts your entire property damage claim and will pay it then great. However, if the insurance company rejects the claim or any part of it then you need to decide what to do? It may be that you need to submit more information (photos, receipts, etc.) It may be that they are denying the scope of repairs, the scope of damage or the covered loss (for example claiming that the damage was caused by a flood and you do not have flood coverage). If your claim, or any part of it, has been denied, don’t necessarily accept the result and move on. Have a Long Island Storm Damage lawyer review your property damage claim and see if there are possible grounds to challenge the insurance company. When visiting your potential lawyer all of the documents mentioned above will be important. You will need a copy of your insurance policy, a copy of the letter you sent to them submitting the claim, a copy of the insurance company’s letter to you, photographs of the damage, and your receipts or estimates for repairing the damages. When you visit a storm damage lawyer there are usually one of two fee structures available. First, you can pay the lawyer hourly. This structure may work well if you have a very large claim and do not want to give a percentage of your damages over to a lawyer. The other structure is a contingency fee agreement. Contingency fees involve the storm damage lawyer taking a percentage of the amount they obtain for you as their fee. If the lawyer doesn’t obtain a recovery for you then no fee is due. This is attractive to many property owners but keep in mind that the trade off is that if they do obtain a recovery for you they will be taking a portion of the money you would otherwise need for the repairs. It never hurts to speak to an attorney about your claim to determine whether you have grounds to challenge the insurance company’s determination of your claim. 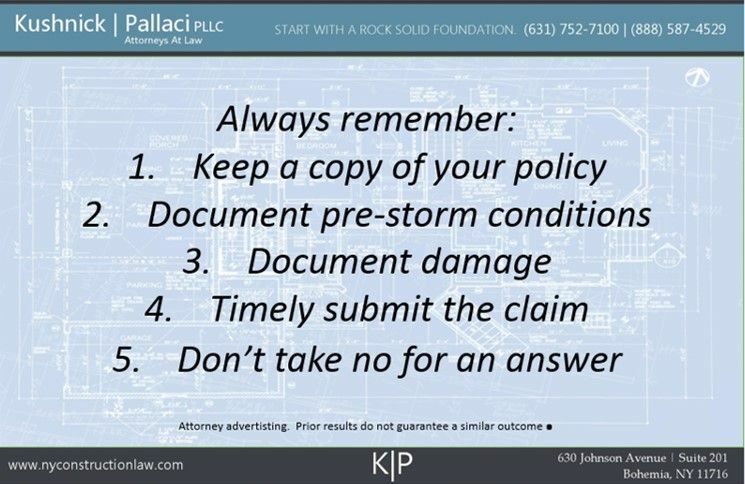 Many law firms, including Kushnick Pallaci PLLC, will offer a free consultation to you and review your claim with you to see what options are available. You can contact us here to speak to one of our attorneys about your property damage claim. If your claim is wrongfully denied our attorneys are also experienced in litigating coverage disputes. This entry was posted in Insurance, Property Damage, Water Damage and tagged Insurance Claims, Property Damage, Storm Damage by VTP. Bookmark the permalink.